"Imaginative poems and prose of great spirit, rich creativity, and three-dimensional imagery." The Columbia Review. “In The Murmuring Trees” by R. Tirrell Leonard JR. is an imaginative volume of poems and prose of great spirit, rich creativity, and three-dimensional imagery. 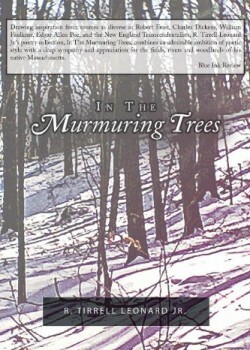 This collection of poems and prose is also a unique exploration of a common sentiment – love – but here it is to a place, as the title of another song reads: “A Magical Country Dance.” One cannot miss Mr. Leonard’s deep love for the State of Massachusetts — both its people (Contemporary and natives) and its raw physical beauty (land and coast). In particular, some of Mr. Leonard’s poetry attains the cloak of youthful wit, alluding to figures from the sphere of fantasy and the world of magic, which would make much of this volume easily accessible and happily enjoyable for younger readers, as well. In summary, this meticulous and beautiful collection leaves the reader shaken, elated and reflective, perhaps as the poet concludes the title poem (or close to it), “In Murmurings Through Trees:” “Skies with lightning flashes bright and brawling, fill my mind with wonders still and installing.” Indeed!